"I think the most valuable aspect of the tech showcase is the ecosystem of exhibitors, investors, and financiers in Newark,” said Lydia McClure, Vice President of Scientific Partnerships, Translational Research Institute. “This is one of those moments that's manufactured but you still get new talent and connections that are valuable for startups to grow. The networks they're making today are massively expanding and taking them to new places." The showcase also featured a panel discussion on the nuances of commercializing deep tech science. 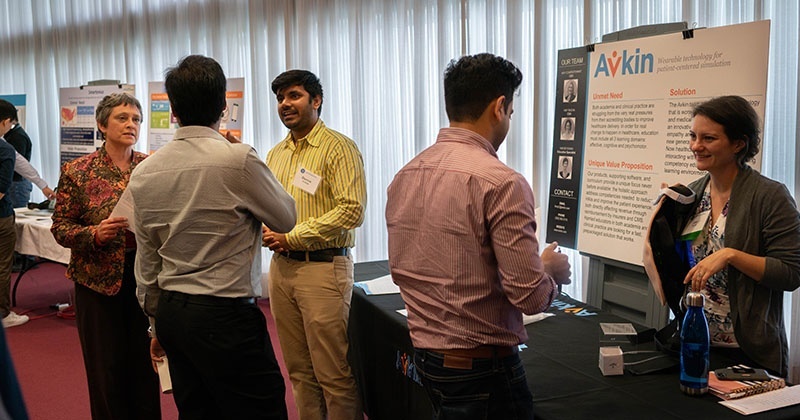 The inaugural event was well attended by prominent members of the UD community, including alumni startup GeoSwap and many of the advisory board members of Horn Entrepreneurship. "I think it's important to showcase technologies and businesses that are being developed at the University of Delaware,” said Pete Wolf, an advisory board member of Horn Entrepreneurship and General Counsel for Nabriva Therapeutics AG. “It's good for the exhibitors to see what other people in their peer group are accomplishing already. The showcase gives the opportunity to spark inspiration about what's important." Some beneficiaries of the inspirational atmosphere were undergraduate students. “You get to experience things you wouldn't be able to if you were in a classroom setting,” said Reilly Boyle, a Chemical Engineering student. “I learned so much from hearing about the exhibitors’ innovations."